Dubbed as the ‘Island Born of Fire’, Camiguin is an amazing place to explore and get in touch with nature. I, for one, have been enthralled by the beauty of the white sand beaches, colorful corals and has been intrigued by its history and how it came to be. The island is surrounded with numerous volcanoes (four stratovolcanoes), hot and cold springs and amazing waterfalls. Camiguin is perfect for those who love exploring nature, be away from the hustle and bustle of the city and just have a stress-free travel! The most common way of going around the island from one spot to another is riding a multicab. It’s a smaller version of the Filipino Jeepney seen at the larger cities, although of course, you have the option to ride the tricycle. My friends and I hired a multicab as our means of transportation during our visit. We had around 2-3 days exploring this small island and we had the time of our lives! 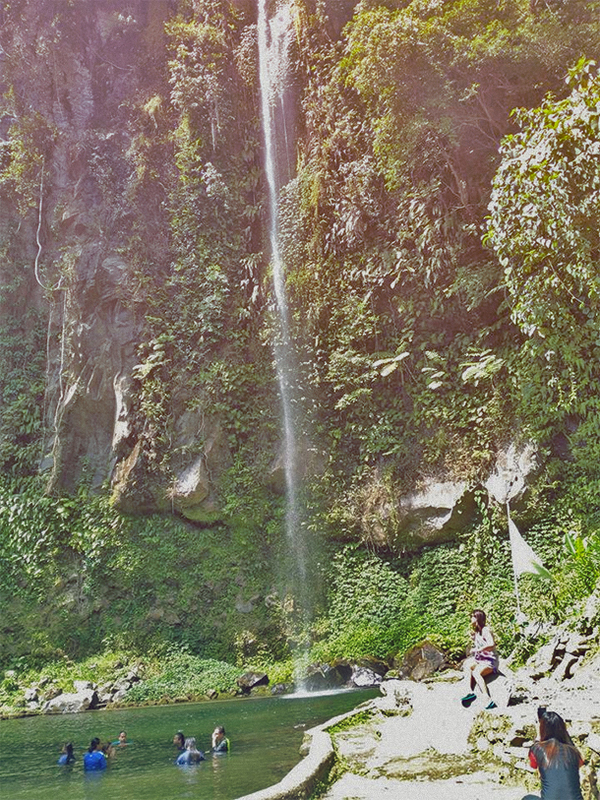 On top of our itinerary was a visit to the Katibawasan Falls. 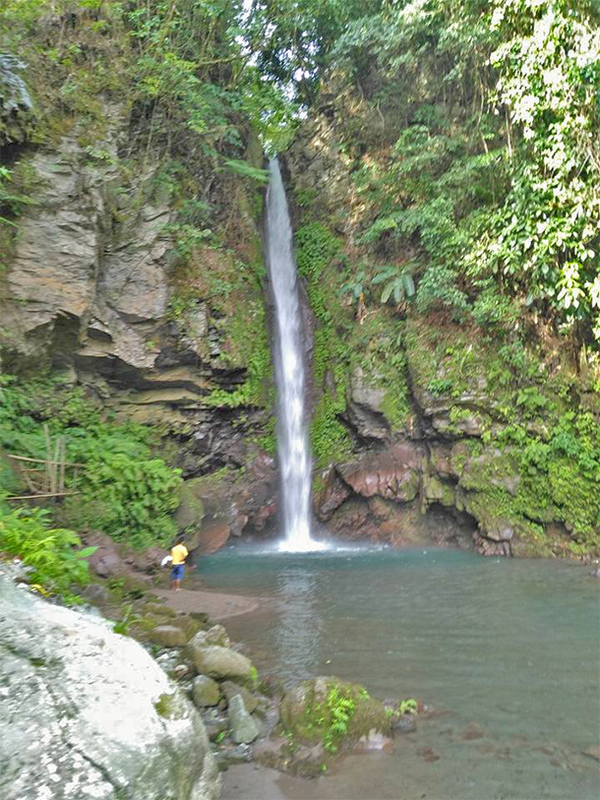 Its one of the must-see falls in Camiguin, measuring about 250-feet high with a partially man-made pool at the bottom. It is maintained by the government, thus the minimal entrance fee and the enclosure that surrounds the area. The ice-cold water of the falls is a must-try especially on a hot day. There are rock tables that you can use should you wish to spend the entire day. You can also try their crispy Kiping (a local delicacy made from cassava with sweet syrup) at the entrance. It’s pretty yummy! If you are into corals, well this is the place for you! 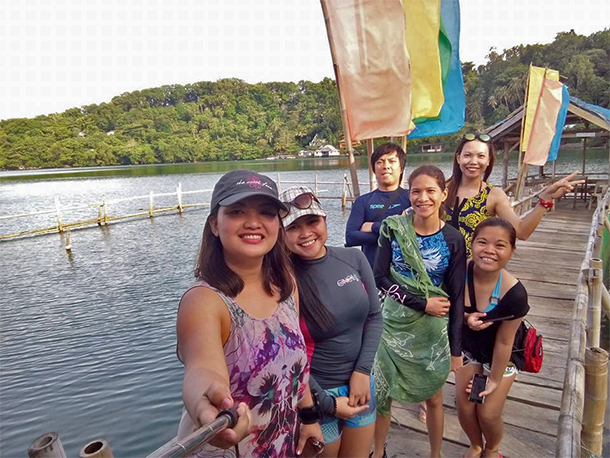 Diving and snorkeling are some of the activities that you can enjoy here not to mention the picturesque backdrop of Camiguin Island. 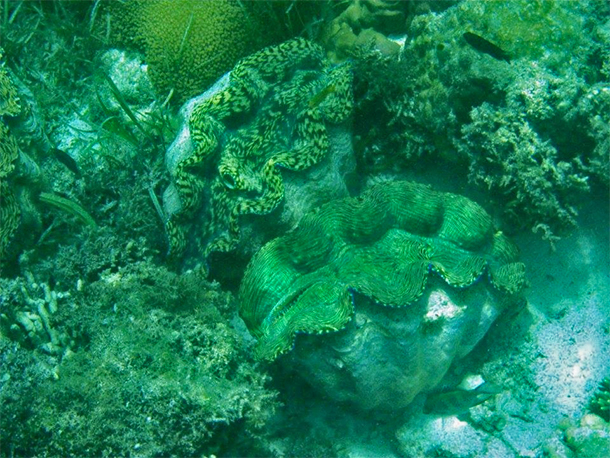 Our guide also showed us this giant clams near the island. Be sure to bring your gear to enjoy it. We had our lunch here under the shade of the trees. There is a small canteen where you can order food for a price. Such an amazing place to relax! With an entrance fee of 25 Php or 0.50 USD, you can visit the Giant Clams Sanctuary in Barangay Cantaan. Here, you will be given a guided tour of the giant clams being housed on a man-made pool. Our tour guide during our visit was a young girl who knew a lot about the giant clams. It was pretty amazing listening to her talk about the clams diligently. Aside from the giant clams on the man-made pool, they also have giant clams in their natural habitat (you have to pay another 150 Php or 2.99 USD to get a closer look). Looking for a place to have lunch or dinner? Try something delicious and fresh at the J and A Fishpen Resort and Restaurant. 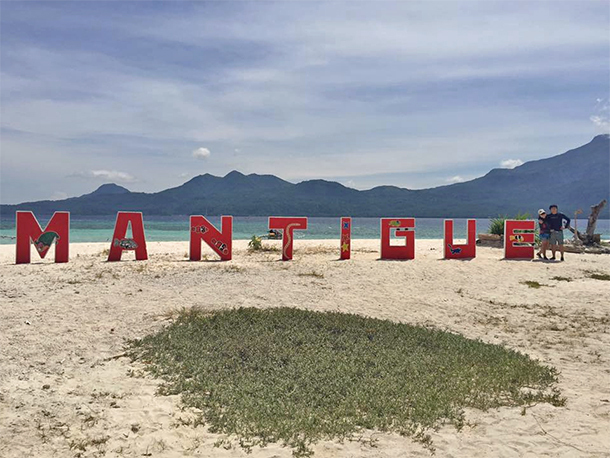 It’s one of Camiguin’s great places to dine in with its amazing views of the water and beautiful landscapes as a backdrop. In our case, since we already had lunch, we just ordered some drinks to freshen us up. 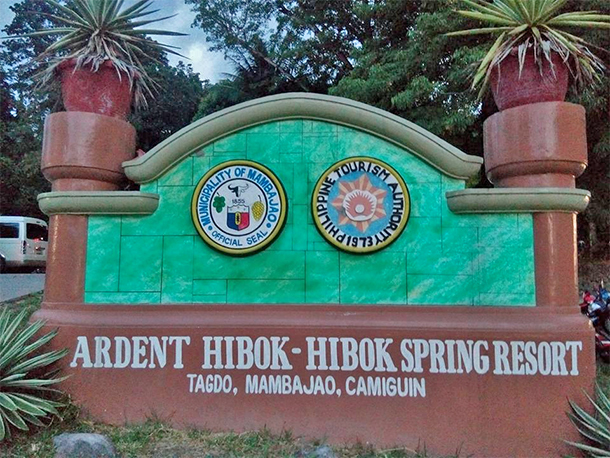 Camiguin has several springs that one should not miss when visiting the island and one of them is the Ardent Hibok Hibok Hot Springs. 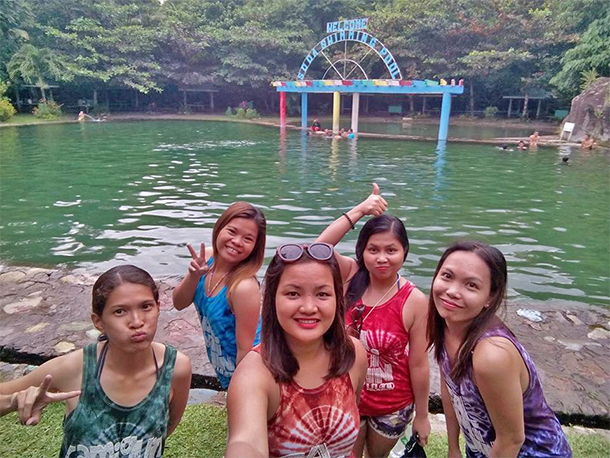 Steam can be seen rising from the 6 pools of hot springs so it is definitely a relaxing way to ease those muscles after a long and fun day of exploring Camiguin. Do you love white sandbars as much as I do? Well, the White Island should definitely be on top of your list! 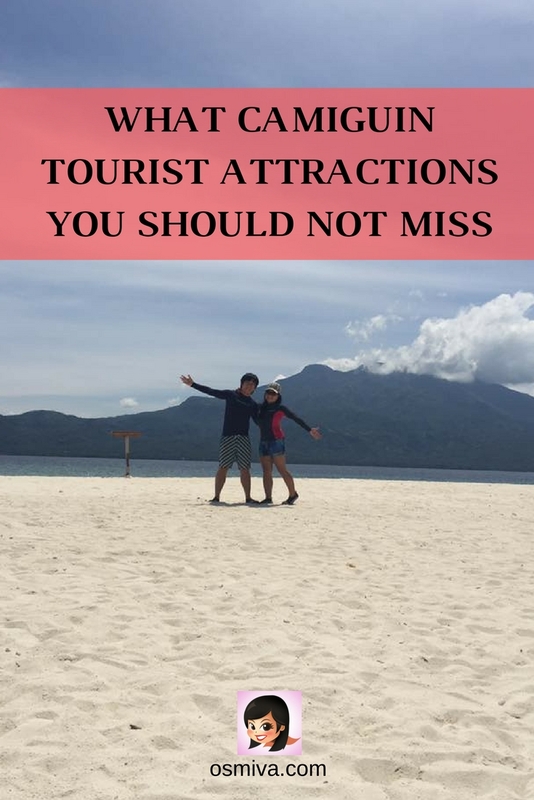 This is one of Camiguin’s most popular places to visit. We headed to the White Island early in the morning on our 2nd day in Camiguin. 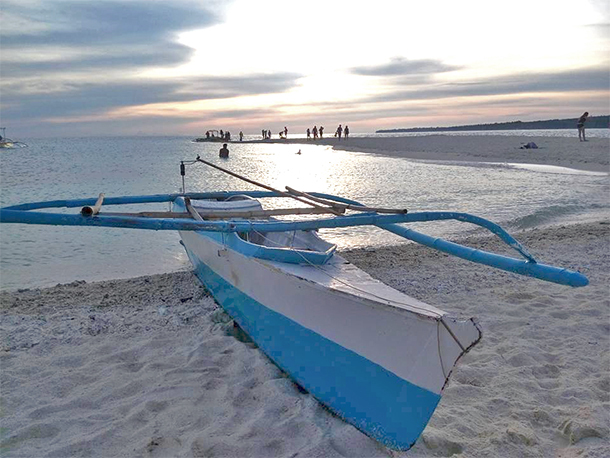 It was a short ‘banca’ ride from the mainland to the island. The island is purely white sand – no trees or any form of shelter, so it is generally preferred to be visited early morning when the sun is not so high up. Not unless of course you are the type who love soaking up the sun for hours. The view is super breathtaking that you can’t help yourself but take tons of pictures and take as many selfies as you can! Want a little hike? Camiguin also has an 8 km path to the top of an old volcano to heat up your body! 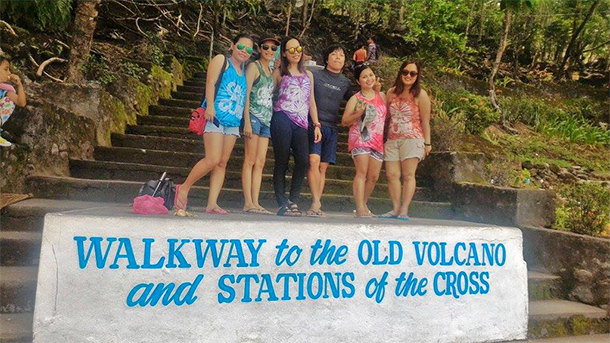 The hike to the top is dotted with 14 life-sized stations, which is a favorite during the Lenten Season. Despite the long hike, the view from the top is equally rewarding so be sure to take a snap or two from your camera and those extra water bottle to keep you hydrated! 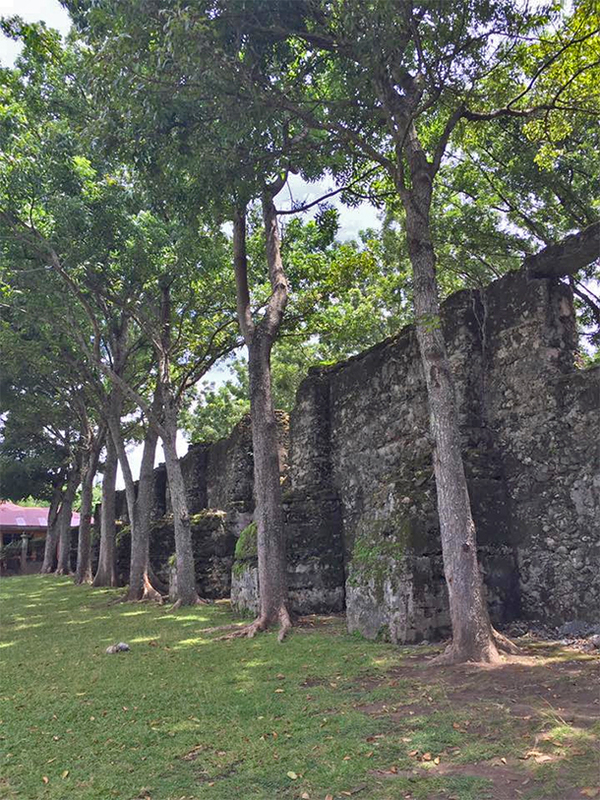 One of our stops during our trip around the island is to the Old Church Ruins in Catarman. The ruins represents a very sad part of the island’s history. Devastated by the eruption of Mount Vulcan during the 1870’s, the walls of the church, the old bell tower and the convent beside it is all that was left standing. Today, the Old Church Ruins is a historical landmark worth visiting. Don’t forget to take pictures of the towering tree inside! 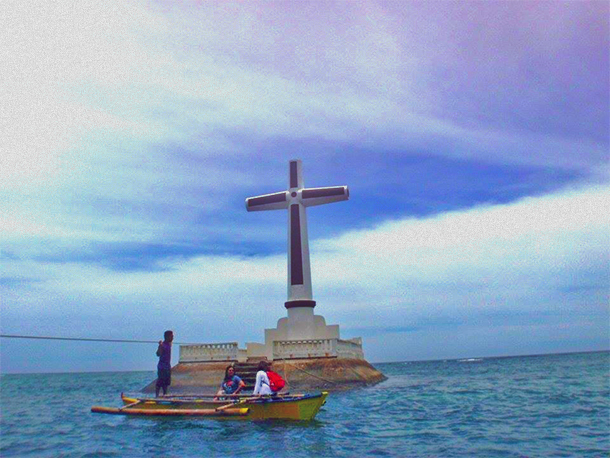 Among the famous spots of Camiguin is the Sunken Cemetery. 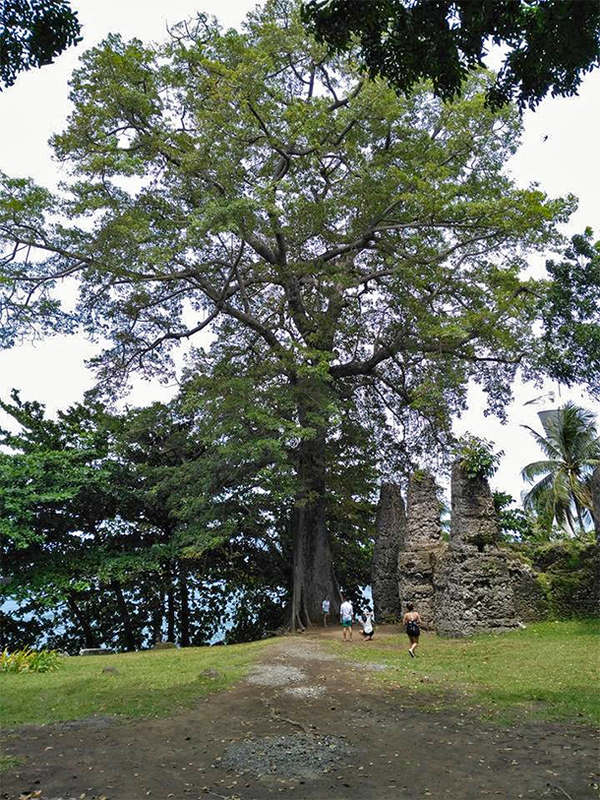 Its rich history is equally as interesting as the corals surrounding the landmark. We were greeted by several souvenir shops on our way to the shore where we rode a small ‘banca’ to the infamous cross. After taking some pictures of the cross, we readied ourselves for snorkeling. Feeling hot especially this summer? Well, a dip to the Sto. Nino Cold Springs will surely take away those heat from your body! We had our lunch at the Sto. Nino Cold Springs (they have cottages as well as tables and chairs – with reasonable price – for those wanting to stay the entire afternoon and you can order food at their canteen) and bravely tried the ice cold water of the spring. The entrance fee is very cheap (around 30 Php or 0.60 USD) so you will notice a lot of families and friends spending their entire day here. We went to the Tuasan Falls in the afternoon on our 2nd day in Camiguin. The road going to the falls was pretty new- it was said to be a project of the local government to make the falls accessible to the public. It was a short walk from the entrance and as you go nearer, you can breath in the freshness and cleanliness of the area. The water is really cool against your skin and is very clear that you wouldn’t resist taking a short dip. Before we retired for the day, we had a quick visit to the Bura Soda Water Park. We did not get a chance to take a dip to the pool, but we were able to enjoy the green scenery nevertheless. Entrance free ranges from 10 Php to 20 Php (0.10 to 0.20 USD) per person (at the time of our visit) plus additional fee if you would use their cottages and tables. 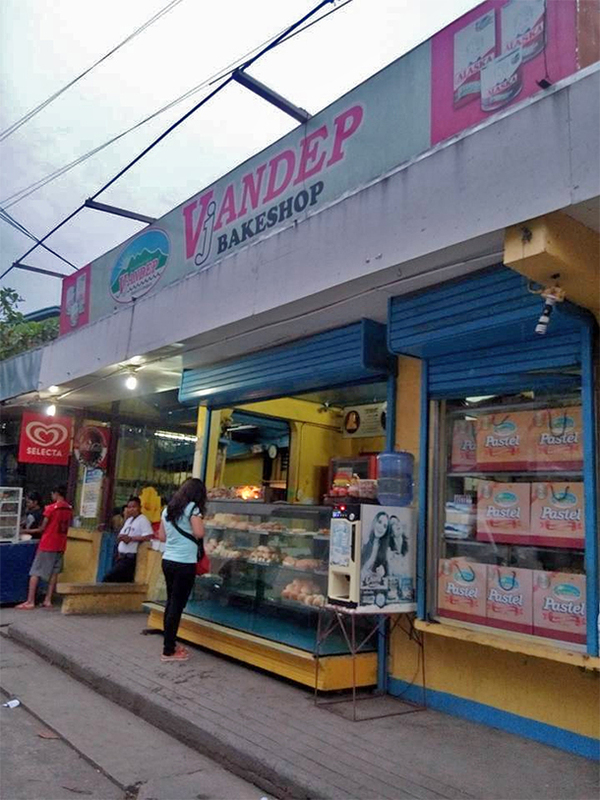 And of course, you must try out Camiguin’s Vjandep Pastel. Its a soft and small bun with yummy yema filling, just perfect with a cup of coffee! We were able to visit one of their outlets/ branches in town. Choosing the right travel destination is very important for you to have fun! 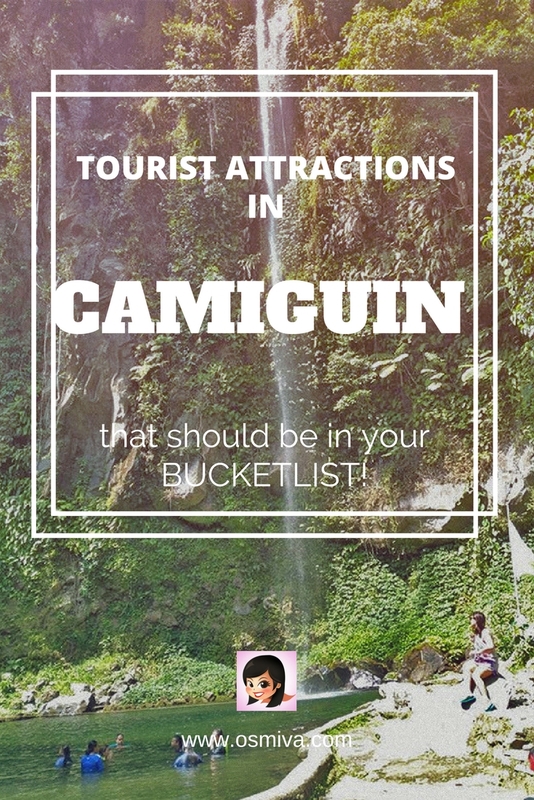 So, who among you here have visited Camiguin? Drop us your comments and share with us your most memorable Camiguin trip! 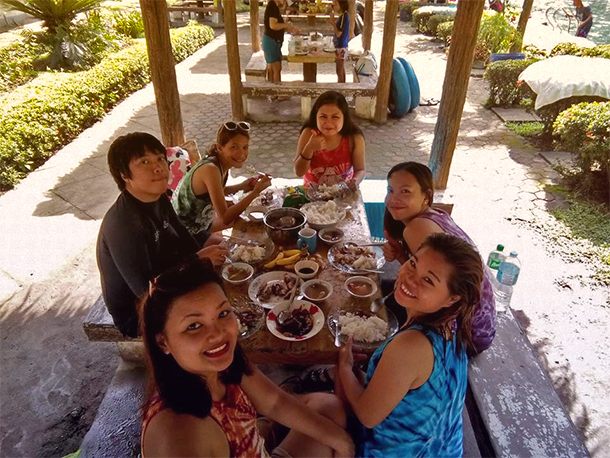 Here is a quick look of our Camiguin Adventure! l love all these destinations! The falls are gorgeous, the white beach and especially the sunken cemetery! We have a whole sunken city here in Dublin so sunken places really intrigue me! Ohhh, what I wouldn’t do for a dip in Tuasan Falls right now! Great suggestions for sites not to miss! Thanks for sharing! But the real gem on this list is that sunken cemetery woah. I seriously have never heard of anything like that – that’s so interesting! Definitely looking into it more. pastel!!! i love the falls by the way but pastel takes the cake! been seeing a lot of camiguin photos lately and I wanna go!!! I love your video that you did! You are one lucky girl – such energetic friends! I can really feel the fun and how fun it is from your video! It looks like a beautiful place. Glad you had a great time! Yep, I did! 😀 Thank you! My husband does the editing. I love this list, from the white sand beaches to the sunken cemetery, and the gorgeous falls, it is absolutely wakening my wanderlust. I have a fascination with cave and the word sunken, so I’m gonna go read more about that sunken cave, and add it to my list of things I want to do in the Philippines. Such a great post and awesome pictures ? Amazing spots. Especially the giant clam sanctuary and the sunken cemetery. Can you also scuba dive around the cemetery? What a cool post!! I had to giggle when I saw the giant clam sanctuary. Also love the idea of the sunken cemetery. Looks very cool!! wow wow wow those clams are HUGE!! It looks like such an incredible place to visit. And I’d never even heard of it before!! It is incredible. 🙂 Camiguin is such a favorite among locals, very simple yet fun! What a beautiful destination. The Philippines is high on my list and I’ve never heard of this area so will definitely have to remember this! That is quite an extensive list! I love hot springs and those giant clams are super cool! 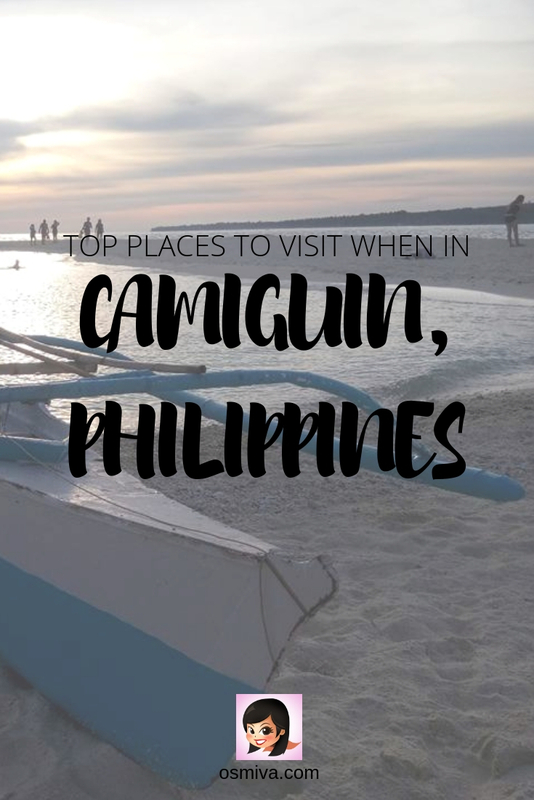 I honestly have never even heard of Camiguin! All of these attractions look like so much fun; especially the clams sanctuary and waterfalls! Thanks for sharing all of these wonderful tips. wow looks like a fun place! I have never been but adding it to my bucket list! Wow, I’d never heard of this island. It’s simply gorgeous…especially the waterfall and White Island. This is such a great guide! The falls look lovely and I’m sure the cold spring is heavenly in the tropical heat. I really would love to visit the sunken cemetery and the clam sanctuary. Philippines is high on my bucketlist for years. Hopefully a dream to come true soon and then I will make sure to add Camiguin to my list. I do hope you can visit it someday, too! 🙂 We have soooo many wonderful places that you can visit. Wow, the giant clams look huge!! This looks like so much fun (: Thanks for this great guide! I really enjoyed my time in the Philippines and I am looking forward to returning later in the year. I was in Northern Luzon and saw some of the giant clams nextto the road side. It was hard to believe they were real. What do that do with the clams? Are they for eating or as a tourist attraction? Wow! I had never even heard of this place until now but really want to go .. Those falls are gorgeous!! Not gonna lie, I geeked out reading about the clam sanctuary and the sunken cemetery! This just climbed way higher on my bucket list! Excellent work Marvi, well written and give the toursit a few idea on what they should look for when visiting the region. keep up the excellent work. Mantigue Island is my favorite! It’s the closest place to paradise.